Fantastic fairways and condition. There were many flights playing twilight so it was slow. Signature Par 3 was spectacular but the sun glare was strong at that time. Overall enjoyable and possibly come back during off peak season. 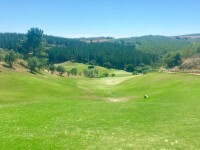 Pretty well maintained fairways, not challenging but a relaxed round of golf. Weather was perfect the day we played with a breeze and sun behind the clouds. First time playing at Vila Sol. It wasnt a particularly challenging course as long as you keep to the fairways. Cow grass rough and loads of trees so stay clear if you can. We started on hole 19 as 1 -9 was closed for maintenance. Chockers when we went back to hole 10 for our cross over. Some fairways werent in the best condition. Overall, did not enjoy as much as other Pestana courses due to slow play in front and tailgating golfers behind. Wonderful golf course!! Not too challenging although there are quite a few water hazards. Well groomed and picturesque!! Not crowded so no following behind slow golfers and tailgated by impatient golfers. We played leisurely and finished within 31/2 hours. Well be back!! Well maintained and quite a picturesque course with no treacherous hazards or challenges. Not alot of shade as the trees are not mature enough. Overall we’ll come back to play for sure. First time playing Vale da Pinta. Very well maintained course. Not too difficult or challenging. Will certainly come back to play. Great course!! Wide fairways but rough is treacherous!! Very dense and swallow the balls even though the grass is not tall. Trees are not mature enough to provide shelter from the heat. Best play in cooler months. To send Josephine a message, please log in to your account or sign in using Google or Facebook. Please Note! The message you send below is not private, we screen every message to ensure that our clients do not receive unsolicited emails or marketing emails. Your full name and email address will also be sent to Josephine.